My Father’s Day sunglasses | Tales From The Ipe! I’ve been wanting a nice pair of sunglasses for awhile now. My problem has been that I have had a tendency to drop, break, or lose them in the past. Because of that risk, I often purchased cheapo sunglasses from the NJ Turnpike travel plazas or box stores. I do admit that I wished I could have nice ones, so I quietly pined for them. Father’s Day rolls around this year, and my wife comes through for me once again. She takes me to the mall, and we find a Sunglass Hut kiosk at our Macy’s. 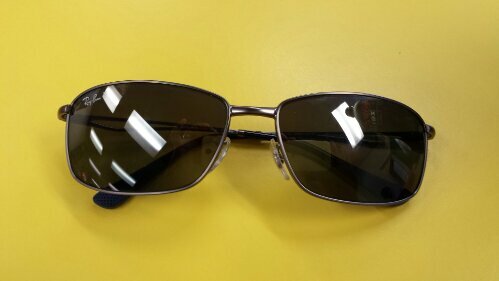 After some browsing, we found a nice pair of Ray-Ban sunglasses in gunmetal grey. This entry was posted in Personal and tagged fathers day, namita. Bookmark the permalink.